When it comes to business success, understanding customers is key. At SugarCRM we’ve always focused on helping our customers to develop better business relationships. To build those relationships and stay relevant in the eyes of their customers, businesses need to pay close attention to what their customers’ behaviour is telling them. The latest Sugar release gives our customers access to higher quality information and improved collaboration facilities, ensuring businesses can base decisions on customer and employee insights. 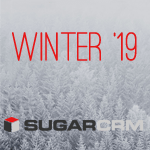 It’s an approach we take ourselves here at SugarCRM, with the habits, feedback and insight of our customers helping to drive our latest innovation with the launch of our Winter ‘19 release, which represents another step forward for our already industry-leading CRM application. Hint Insights is an exciting new addition to Hint, our innovative intelligence product. The right decisions are made when people have access to good quality information. Hint enables users to uncover deep customer insights, pushing relevant information to users via multiple channels. From breaking news to important signals such as personnel changes within key accounts, it ensures users are fully up-to-date on the latest developments within their business, in their industry and with their customers. In Winter ‘19, users can also download any report type to a CSV file, adding further flexibility to how business insights are gathered, processed and digested. By enabling users to drive automation through all aspects of customer operations, Winter ‘19 increases efficiency dramatically. Through Advanced Workflow users now have the ability to automatically create and update multiple records. For example, when a call is made, Advanced Workflow can automatically inform all those involved with that account of the latest communication. Plus, Advanced Workflow now equips users with a smarter business process designer, prompting them when errors occur and allowing a smoother construction of activities. Users can also create notifications using the system, incorporating both new and old values, so progression or regression can be seen immediately within accounts – giving users the opportunity to react to changing scenarios. It’s no secret that businesses rely on teamwork to make the dream work. Communication is key, especially when providing a relevant and successful customer experience. That’s why we’ve incorporated a new Comments Log into Winter ‘19, allowing users to keep track of each other’s progress and never be let down by a lack of communication. The Comments Log feature is enabled by default in the bugs and case modules, and can be added to any module throughout Sugar Studio. It allows everyone involved in an account to share the relevant customer knowledge in chronological order, without getting lost in emails. An important factor of each organization is the seller’s ability to focus on achieving optimal results – without being bogged down by a lengthy or complex sales process. That’s why we’ve introduced a new dashlet, Product Catalogue Quick Picks, that conveniently presents users’ most frequent and recent products and gives sellers more time to craft an excellent, relevant and efficient customer experience that is deserving of a fantastic outcome. As an innovative and industry-leading CRM provider, we work with businesses as true partners to ensure the system is right for them, grows as they do and ‘just works’. By listening to our customers and continuing to develop our product in line with their needs, we’re able to help them improve their products and services for their customers, so they can build lasting relationships and stay relevant in highly competitive marketplace.